ONE Championship (ONE) once again electrified the Jakarta Convention Center with another blockbuster evening of adrenaline-pumping martial arts action. In the main event of ONE: GRIT AND GLORY, Yoshitaka “Nobita” Naito of Japan reclaimed the coveted ONE Strawweight World Championship, edging out Brazilian rival Alex “Little Rock” Silva via razor-thin split decision. With both men flaunting their delicate expertise on the mat, it was a technical grappling display as Naito and Silva battled for leverage. With the drive to recapture the gold that he lost to Silva last December, Naito punctuated the final round in dominant position to emerge the victor on two of the three judges’ scorecards, earning him the split decision win. In the co-main event of the evening, local martial arts superstar Stefer Rahardian of Indonesia sent the crowd into a rapturous chorus of cheers with a spectacular performance, clinching his ninth straight victory with a submission finish of Himanshu Kaushik of India to remain undefeated. Rahardian quickly took the back and secured the rear naked choke to seal the deal. Leandro Ataides of Brazil solidified his position as a top contender in ONE Championship’s talented middleweight division by defeating former world champion Vitaly Bigdash via third-round stoppage. Ataides relentlessly poured down harrowing blows to secure the finish and claim the GoDaddy Knockout of the Night award. Making his ONE Super Series debut, Lithuania’s Sergej Maslobojev authored a stellar performance to the delight of the crowd by routing Croatian foe Antonio Plazibat in their highly-anticipated rematch. Maslobojev closed out the final round of the match on a strong note, unleashing a volley of punches that steered him to a unanimous decision win. Local female martial arts star Priscilla Hertati Lumban Gaol continued her winning ways, taking her third straight victory in the ONE Championship cage with a submission finish of Rome “The Rebel” Trinidad of the Philippines. As Trinidad tried to fend off the submission, action transitioned to the mat with Gaol still holding on to Trinidad’s neck and the tap came shortly after. 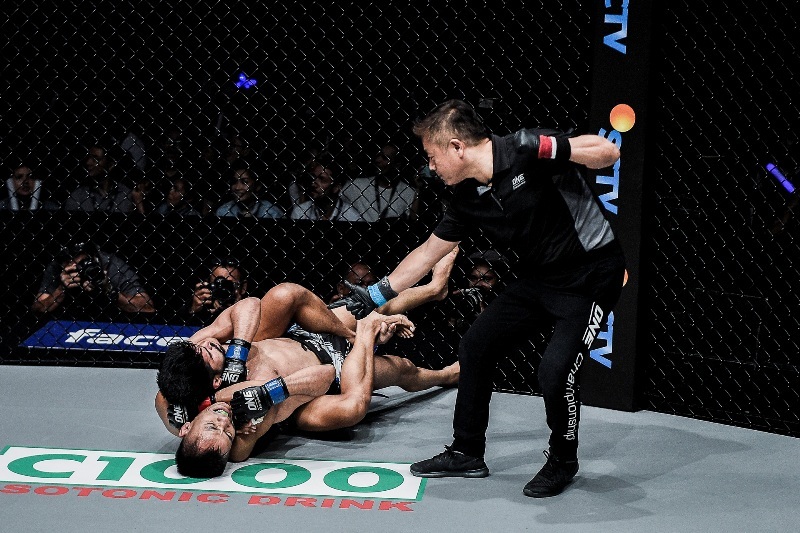 A gruelling featherweight showdown between Sor Sey of Cambodia and Victorio Senduk of Indonesia transpired inside the ONE Championship cage. Sor Sey’s gallant effort was rewarded by the three judges at cageside with a unanimous decision victory. In a catchweight contest, Tetsuya Yamada of Japan claimed victory inside the ONE Championship cage, finishing veteran martial artist Eric “The Natural” Kelly of the Philippines by first round submission. Yamada quickly took Kelly’s back and locked in the rear naked choke to force the tap. In a ONE Super Series bout, hard-hitter Ognjen Topic of Serbia emerged triumphant against Stergos Mikkios of Greece via unanimous decision in a three-round Muay Thai clash. All three judges ruled the bout in favor of Topic. Singapore’s Radeem Rahman made a successful return to the ONE Championship cage after a long three-year absence, making quick work of opponent Tang De Pan of China. After Rahman took Tang to the mat and secured the back, the Singaporean locked in the rear naked choke that forced the tap. Indonesian national wrestling champion Elipitua Siregar figured in a brilliant professional debut, dominating countryman Dodi Mardian in the first round to score an exciting submission victory. Siregar overwhelmed Mardian from start to finish, clinching the win with a rear naked choke barely four minutes into the contest. Indonesian strawweights Riski “King Kong” Umar and Doan Birawa kicked off ONE: GRIT AND GLORY with a spirited exchange of strikes to the delight of the packed Jakarta Convention Center crowd. After an intense first round which saw both athletes have their moments, Umar took advantage of an exhausted Birawa in the second round, forcing the tap from a deep rear-naked choke.